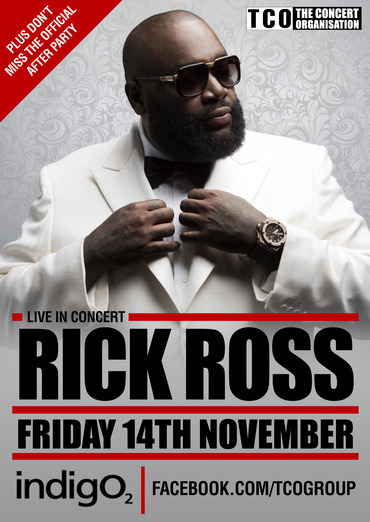 Rick Ross returns to the UK to coincide with the release of his 7th album Hood Billionaire HOOD BILLIONAIRE on Friday 14th November at indigo at The O2. The first taste of the new album Elvis Presley Blvd dropped on the internet and radio on Monday 15th September to rave reviews as Rozay returns with his second album in a year. Rick Ross already released one album this year, the orchestrally grandiose Mastermind, and now he’s planning on following it up with a new album called Hood Billionaire before the end of 2014. First single Elvis Presley Blvd works as an extended homage to Memphis rap and features a verse from Memphis original Project Pat, who should really guest on every rap song. It’s an impressively guttural track, harder and more immediate than almost anything on Mastermind. And its new video, from frequent Ross collaborator DRE Films, is nearly as tough. It has Ross kicking around Memphis and hanging out with a bank-robbing Elvis impersonator, which seems like the thing to do when you’re in Memphis. Maybach Music Group’s “Big Boss”, is the hottest MC in the game with six number #1 albums already under his belt. In support of his latest album drop, the Hood Billionaire tour will be one not to miss. CLICK – TO BUY YOUR TICKET(S) NOW!